Post Your Business's Coupons FREE! 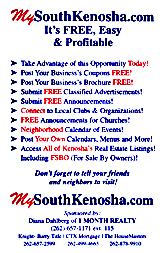 Post Your Business's Brochure FREE! Connect to Local Clubs & Organizations! Post Your Own Calendars, Menus & More! 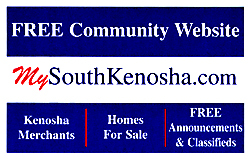 Access All of Kenosha's Real Estate Listings! Including FSBO (For Sale By Owners)! Don't forget to tell your friends and neighbors to visit! Watch For These Flyers And Bumper Stickers Around Kenosha!